From Ahirs' valour in 1962 war to Chamar regiment’s honour in WW2, caste-based regiments’ celebration provide ground for their inclusion in Army. While we may or may not include these caste regiments I am of the strong opinion that a Gujjar Regt with muslim Gujjars from J&K . They are brave sturdy tall and honest people and can stand sentinels of our Jammu region borders with Pakistan. Infact that regiment can even have one or two pure battalions of female Gujjar tribe. Defence ministry should think about it. You are a sick print , why the hell are we even discussing issue like cast and religion regiments in our Army, This is not the right way of using your right to expression or speach. Can’t you think twice before printing any article or just printing for the sake of publicity. As usual, The Print will not desist from writing any thing but derogatory to Armed Forces. And Mr Mondal your claim being senior journo is doubtful when you refer to cast analysis of martyred 40 CRPF personnel by some magazine, it could only be Print who can do such analysis to further cast aspersion on uniformed persons. And you on your part being so self proclaimed senior journo, not done well when you attribute malaciously in this article above, ” In the recent Pulwama attack, in which at least 40 soldiers were killed, there were several from the Ahir community. The caste analysis of the Pulwama martyrs, carried out by a magazine, had raised many eyebrows, because the study revealed how Hindu upper castes, that are usually at the forefront of the masculine, nationalistic fervour, are hardly ever found among the martyred” This really written with hatered against possibly BJP and Modiji because Print can not think beyond this. Your leftist thinking is not going to divide armed forces. Do try very hard it is going to boomerang . And why not kahar and kachhi and sunar and so many more regiments. Each and everyone can fight. If not with enemy than with each other. The politicians drop a bomb to further their own interest and there is no dearth of journalists to publish their research work. In an already divided society based on religion and caste some people are working hard to make further inroads. The politics have entered all other areas, military seems to be the target now. Why are we even discussing caste segregation. Some how ‘Mazhab Nahi Sikata Aapas Mein Bair Rakhna’ doesn’t seem to sink in. We are Hindus short form for Hindustani! By that logic all those who are born in INDIA are Hindus, irrespective of caste, creed, culture or any fancier upbringing. Surprised to see Mr Mandal giving gyan based on caste politics in Indian Army, we the soldiers r already fed up of politicians and there politics and now u have jumped the train. Guys be sensible to wat u write and think twice before u publish. U r not even fit for being a journo forget to write about Army. Take rest and treatment brother . The Constitution makers, while espousing equality for all in Preamble, themselves propagated continuance of caste system by reservation for SC/STs. Subsequent politicians for their own selfish reasons have only increased it from 22.5℅ to 60℅ and from 15 years to now permanently. Many people may not be aware that Revenue Deptt maintains caste record in revenue documents and their certificate is essential to claim any reservation benefit. But if u call a chamar by his caste, police puts u behind the bars on his complaint. Now the same chamar is willing to form & join a Chamar Regiment. Isn’t it propagation of caste system further ? In WW-II, Brishers raised Chamar Regiment in 1943 as last resort as they faced acute shortage of recruitable males among martial castes beyond a point due to ongoing Independence Struggle and fighting on multiple fronts. Incidentally, enrolment in armed forces is already done on regional or all class basis. In Infantry also, many battalions are pure only for the namesake, often having companies of different communities. Let us not divide this beautiful country further on the basis of caste, creed or religion. Enemy bullet does not differentiate between a. Brahmin and and Shudra. Let armed forces better handle their issues themselves. They belong to entire nation. A “senior journalist” is “fighting” to tinker with the structure of the Army, with full authority but no responsibility for the result of his action. While certain old regiments have a class basis, this senior journalist is unaware that the overall composition is based on the distrbution of classes in the national population. In units, field kitchens are company wise. Hence while battalions may be mixed, companies are generally not. Further by having units based on ethnicity, continuous contacts can be maintained with families as companies, platoons are composed of soldiers from same and nearby villages. It also helps when the army is called out to quell riots. Depending on where the riot is, appropriate regiments are sent so that the soldiers have no affinity with local population. 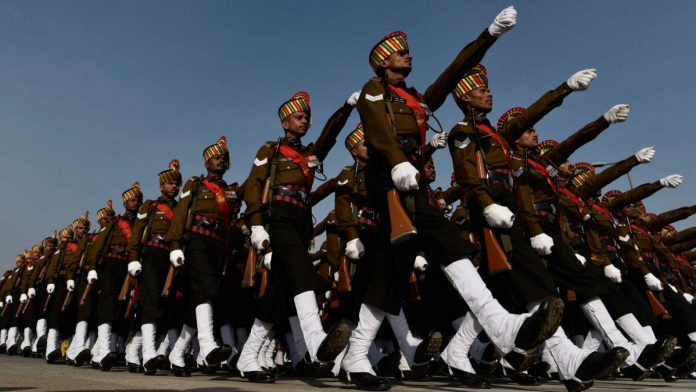 Indian Army Infantry Regiments were based caste & community to strengthen Regimental Esprit de Corps. While there are numerous castes, not even once is it used in communication and execution of orders either in Peace time or War. But yes, in all times each soldier of any Regiment takes pride in his Regimental ethos and traditions. To uphold the Regimental Valour, the spirit of Regiment is invoked and not caste and subcaste. The author would have done well to ignore such calls of caste based politics being raised by few prejudiced political sections vis a vis Armed Forces. Lastly, there is a need to handle these topics with care rather than headline as Brave Ahirs & Honourable Chamars….